One of the oldest and most venerable brands in the golf equipment business has just released the latest entry in the trend toward ever-lower compression golf-balls. With the introduction of its new DUO Soft distance ball on Friday, November 17th, Wilson Staff has put into play a sphere that at impact deforms almost as much as a marshmallow, yet for slower swingers ostensibly flies like a bat out of hell. And with those pitches, chips and flops around the green, its delicate feel is equal to anything on the market, if not incomparable. Compression is a term and/or number that refers to the hardness or softness of a ball, essentially a measure of how much it deforms at impact. Most balls carry a rating of 60 to 100, the latter of which is rock hard. The DUO Soft, however, comes in at a record low of 29. With a low spin rate off the driver, Wilson claims that the 2-piece, Ionomer-covered ball is also longer than its direct competitors. Perhaps best of all, the DUO Soft – – which comes in white, brilliant orange and a cool shade of yellow – – retails for $19.99 a dozen. That price point will help within a market that’s not for the faint of heart. Titleist and Callaway are dominant brands, while Bridgestone competes in the super-quality category with balls of differing attributes. Srixon and others also grab shares, as has Wilson, a brand with an almost mystical patina. 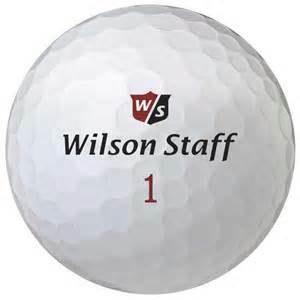 For older golfers, Wilson Staff is an iconic name, calling to mind those bygone days when serious players purchased clubs only from the PGA professional at a Club’s pro shop – – and they were almost always Wilson Staffs. Founded in 1914, the company and its sticks have been favored by legends including Sam Snead, Walter Hagen, Patty Berg and Cary Middlecoff. Wilson advisory staff member Gene Sarazen welded a piece of steel to the sole of a Wilson wedge and created the world’s first sand wedge; its “bounce” and performance led to the sale of 50,000 in 1933 alone. One does not see as much Wilson Staff equipment as in the 1950s, but the DUO Soft has a good chance of doing well in the rowdy ball market, both on the aura surrounding the brand and its unusual compression. I can’t personally say whether the ball is long, having played it only on cold and damp days with heavy air. But I can testify that the softness is noticeable with the stroke of a putter, and performance that’s obvious in the control of pitch shots and chips. And for $19.99 a dozen, that’s a formula tough to beat.